The son, and first child, of a school Principal, Sherlo Shively, and a Kindergarten Teacher, Ila Shively, David was born and raised in Bakersfield with his two sisters, Karen Blockley and Diane McConnell. Gaining his primary education from the schools of Horrace Mann elementary, Harding elementary, Compton Junior High, and East Bakersfield High School. After high school, David moved to La Verne to attend college where he receieved his Bachelor of Science degree from The University of La Verne before moving to San Francisco. Knowing dentistry was what he enjoyed, David chose The University of the Pacific School of Dentistry where he completed his studies to earn the degree of Doctor of Dental Surgery or D.D.S. Dr. David D. Shively D.D.S. returned to his home town of Bakersfield, CA and began practicing dentistry. Dr. Shively has been practicing Dentistry in Bakersfield for more than 30 years. First born in a family of two, Roger was raised in Paris, France where he spent the majority of his childhood. His parents, Chieu Pham and Hieng Te, were immigrants looking for a better life for their children. Roger has one brother who is also studying to be a dentist. Roger grew up speaking French and completed his education in France where he attained his certification before moving to the United States. There, he completed his primary education at Westminster High School in Orange County. After high school, Roger obtained his Bachelor of Science at the California State University in Long Beach. After contemplating the health field for a while, Roger set his course upon Dentistry where he knew his love for art could also be combined with his knowledge of science in order to help others get healthier and simultaneously feel better about themselves. Roger chose to attend the prestigious University of Southern California's Ostrow School of Dentistry, where he became a Trojan and where he also earned degree of Doctor of Dental Surgery. Roger also completed a year of Advanced Education in General Dentistry at the University of California, San Francisco in order to be more proficient in treating his patients. In his spare time, Roger enjoys reading books, spending time with his girlfriend, watching movies, and staying active working out and playing volleyball. He is also an avid promoter of health through education using various media outlet. 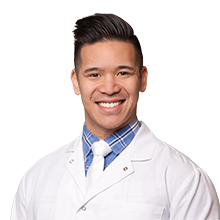 You can find him on Instagram, Facebook, and Twitter as "The Honest Dentist"
Dr. Pham has been serving his patients for over 7 years now.